History is being made in the European Union (EU). The Euro Challenge, a program of the European Commission, provides an exciting opportunity to bring this history to life in high school classrooms across the U.S. W!se has been the national coordinator since the program’s launch in 2006. 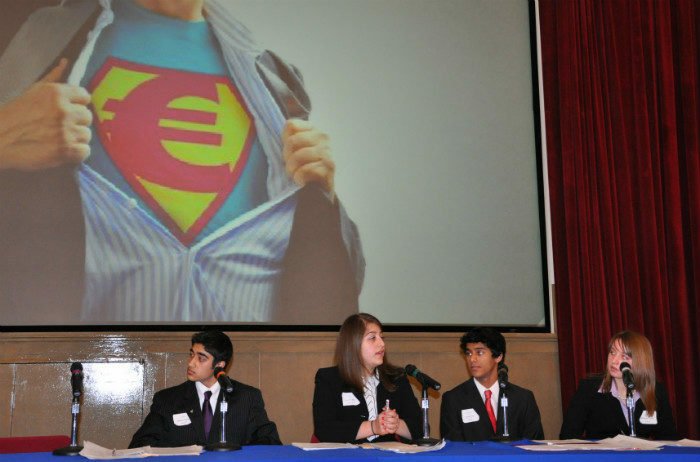 Organized as a competition, Euro Challenge motivates teams of 9th and 10th grade students to explore economic and social issues facing the Euro Area, propose solutions and compete against teams from other high schools. Student teams select and research one issue from a range of challenge issues such as the debt crisis in Greece, economic growth in Italy, or the aging population in Germany and present their findings during regional competitions in March. The top teams in each region advance to the national finals, held at the Federal Reserve Bank of New York in April. Finalists win monetary awards generously sponsored by the Moody’s Foundation. The top two teams visit Washington, D.C. for a day and deliver their final presentation to embassy officials of the country they analyzed. The Euro Challenge is more than a competition; it is a truly valuable learning experience. To help students prepare, orientations, webinars and news reports are offered during the year and many resources are available through the program’s website. This rich interactive portal provides students and teachers with access to a vast library of information including interviews with past Euro Challenge participants, fact sheets on the countries in the Euro Area, research materials, links to databases, sample presentations from previous years, questions on each challenge issue and articles on the EU economy and the euro. High school freshman and sophomores learn skills vital to college success, including research, analysis, communications, critical thinking and teamwork. The Euro Challenge also offers students their first taste of economics, an exciting and enlightening prism through which to explore the world. Visit the Euro Challenge website to learn more. You can also request information, register for the Euro Challenge, and get involved as a judge, mentor or other type of volunteer.